HubSpot is probably the most intuitive, useful blogging platform around, and I’m not just saying that because we’re a HubSpot inbound certified agency. It’s more truthful to say we chose to become HubSpot certified because it’s so great. 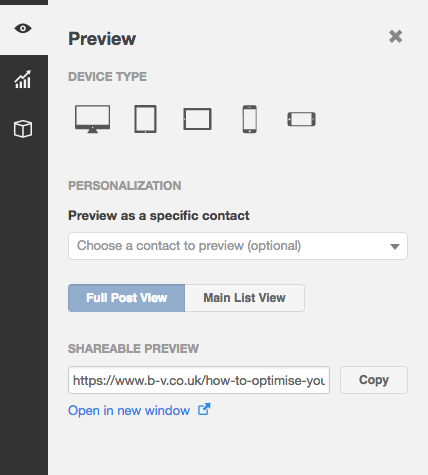 HubSpot blog posts are automatically optimised across all device types. You can preview how your post looks on desktops, tablets and smartphones by clicking the eye icon on the left hand side within the editing tool. The most important features to optimise in terms of responsive design are text paragraph length (text should be broken up into smaller, digestible chunks for smaller screen sizes), images (these should be automatically scaled down for mobile, but are the images still clear?) and also the amount of text above the ‘More’ tag (i.e. how much shows on the main blog page; for mobile it is better to keep these intros short so visitors can see more post previews at once). There’s no need for plugins on HubSpot, because the blogging platform already offers an SEO optimisation function as standard. When writing a blog post, on the left hand side underneath the eye icon is a graph icon. Click on this, enter your target keywords and then refer to the tailored to do list. 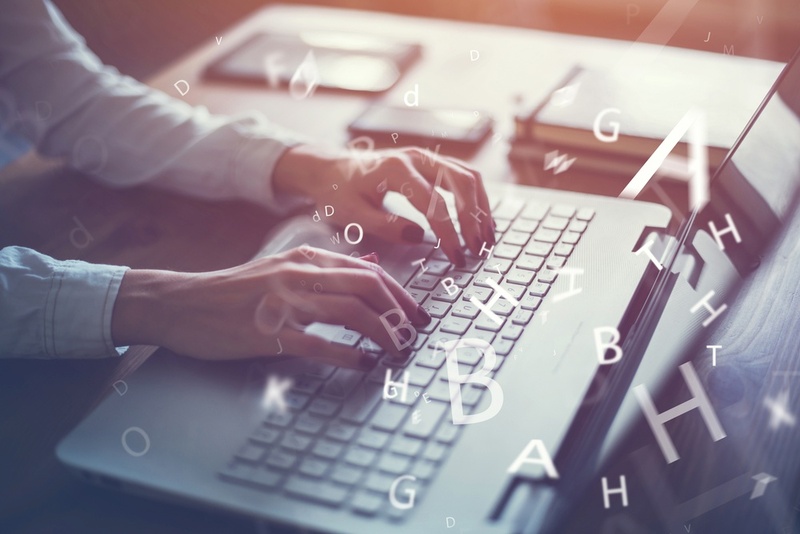 It contains items relating to your meta data, content body and title and checks for keyword density so you know how you can optimise your content. 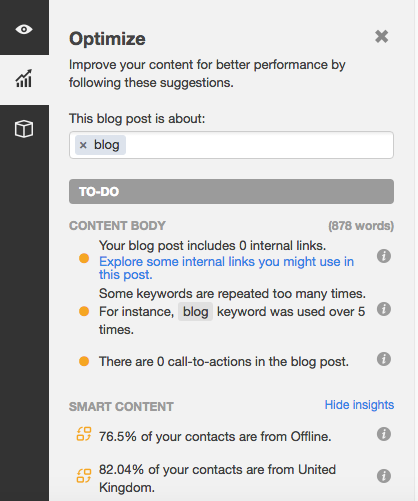 Once you’ve published a post, you can click on it and move to the Optimisation tab to assess your on page SEO. Each post is given a percentage score (the higher the better, aim for the 90s) and a list tells you what’s looking good, from an SEO perspective, and what could do with some work. By navigating using the menu to the left hand side, you can view your Ranked Keywords, Inbound Links, CTAs and Internal Links, to and from your blog post. This will help you see what you can improve on to grow your organic, search engine traffic. Once you’ve created a call-to-action, you can easily insert it into a post by clicking on the option on the Insert dropdown within the editing tool. As well as the design (colours, copy) of your CTA, its position within your blog post is also an optimisation variable to A/B test. You can place CTAs towards the top of your post or the end, or both; experiment with the options until you find your sweet spot in terms of clickthrough rate. If you want to further optimise your CTAs, you can opt to add a smart CTA. Just click on the dropdown within the CTA window, and opt for Create a Smart CTA. This will enable you to show different CTAs to different contacts on your list, based on either their country, device type, referral source, preferred language, which contact list they are on or which lifecycle stage they are at. This helps increase relevancy; your visitors, subscribers, leads and customers are more likely to convert if they see a call-to-action that is well-matched to them and their needs. For example, someone in the UK might not be drawn towards a piece of content that applies to the US, and people at the end of the buyer’s journey are more likely to convert by downloading a piece of content related to purchasing decisions than an awareness piece, and vice versa. Want a dashboard with all the important metrics and graphs so you can analyse your performance over time? HubSpot has got you covered. When you’re on the main blog dashboard, go to the Analyse tab. The first graph you’ll see is overall views, which is set for ‘This month to date’ compared to ‘Previous month’ by default. You can select different timeframes from the drop downs for further comparisons. There is an overall view count, as well as a percentage change. Scrolling down, there is a Subscribers graph, a table showing your Most Recent Posts with essential metrics for each (views, CTA clicks, click-through rate), followed by your Top Posts by Views, Top Posts by Click-throughs and Top Posts by Conversions. Again, you can select the timeframes from the drop downs. You can also opt to See all posts for each of these categories. These graphs will allow you to compare the performance of your posts, so you can draw conclusions about what works and what doesn’t, for example, clickthroughs are higher when the CTA is higher up in the post, or CTAs that are more closely related to the content of the post mean more conversions, and so on. Clicking on individual blog titles will bring you to a page showing the Performance for that specific post, so you can see where your traffic came from and assess the success of your SEO, email and social media campaigns, for example.